It is easy to see that the temple of Vera Cruz, in O Carballiño (Ourense), is a unique building. Despite its archaic forms, it is relatively modern, since it is only three-quarters of a century old, which, when it comes to churches, is very little time. Construction began in the summer of 1943 and is one of the masterpieces of the great Galician architect of the twentieth century: Antonio Palacios Ramilo, from Porriño. Palacios is well known for the works he designed during the first part of the century in the Spanish capital. In Madrid you can enjoy several key designs from his artistic career: the Palacio de Comunicaciones, today the seat of the City Council, is probably the most significant and recognizable of them, but the Círculo de Bellas Artes, the Instituto Cervantes headquarters or the Maudes hospital, fixed points of any architectural tour in the Spanish capital, are also result of his ingenuity. The marks Palacios left in his native Galicia are also remarkable. His is, for example, the curious Town Hall building in O Porriño, where he was born in 1874. It is a sort of contemporary castle that transports the observer to a different time and place, even located. as it is, in the centre of this industrious town in Pontevedra. Or the modernist municipal nursery standing in the middle of the Alameda de Santiago de Compostela, the only thing left of the Galician Regional Exhibition of 1898, painted white, like sweet merengue, among the vegetation of the capitol’s great park. This taste for contrast can also be discerned in the Templo de Vera Cruz (Temple of the True Cross) in O Carballiño. The town expanded significantly during the twentieth century, and modern neighbourhoods, some with more architectural success than others, were annexed to the historic centre, which is currently visited by hundreds of people who wish to try gastronomic delights such as octopus (this is said to be the place in Galicia where it is best cooked). In one of these neighbourhoods is the Vera Cruz, commissioned in 1942 by the local parish priest and his neighbours taking advantage of Palacios’ sojourn in Ourense. Back then he was already a famed architect, and a project such as that was no small thing for the town. The first stone was set in 1943. 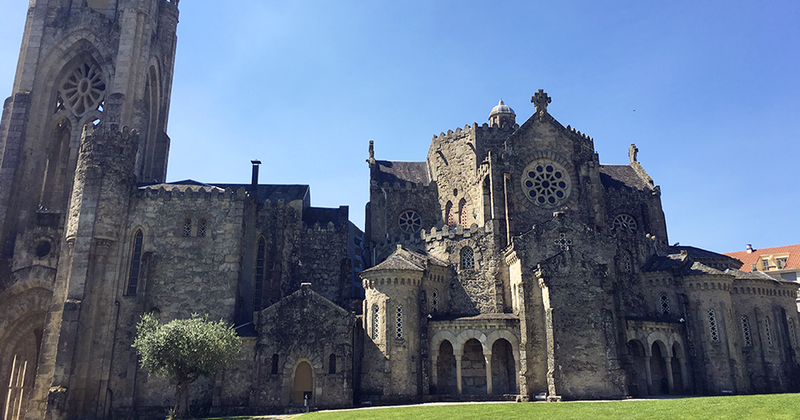 It was perhaps the last great work of Palacios, who died just a couple of years later, and is owed to another great religious building designed by him in Galicia, the Templo Votivo do Mar in Panxón (Pontevedra). The main naves were finished in 1948 and the tower in 1957, although the church opened to worship in 1952, for the San Cibrán festivities, the town’s patron saint. The temple is built entirely out of local granite and slate and is a mix of styles. Neo-Romanesque apses are mixed with pointed arches, corners that are zealously kept in shadows contrast with large windows that fill the building with light. The tall tower is possibly the most recognizable point of all of O Carballiño, and lights the town like a medieval lighthouse seeking to touch the sky.